A Russian jet carrying 50 passengers has disappeared from the radars during a demonstration flight for potential buyers in the Indonesian capital. Hijacking and a high-altitude crash into a mountain have not been ruled out. Due to low visibility and fog the helicopters had to stop the search and return to base. The rescue operation is now restricted to a ground search. The search will continue throughout the night. “Now we are mobilizing ground teams in coordination with the local police and military units to find the aircraft’s whereabouts,” the Indonesian Search and Rescue Agency chief, Vice Marshal Daryatmo told the Jakarta Post. Rescuers have updated the plane's last-known coordinates and narrowed the search area. In the morning, five helicopters are expected to join the rescue operation. According to Russian diplomats, connection with the plane was lost as it passed over the western end of Java. The search mission is concentrating around Mount Salak, a 2,200-meter-high volcano about 50 km from the airport. Indonesia's Transport Ministry is still considering the plane as “missing,” as a crash has not been confirmed. The latest reports suggest the mobile phones of several passengers might still be working. Blogger and traveler Sergey Dolya, who was on a previous flight on the same aircraft, tweeted that he has been trying to call his Russian friends for several hours. “Sometimes the calls go through, sometimes they get rejected. But no one picks up. Locals do not know how to locate [the phone’s position],” a recent tweet by Dolya says. Dolya has also tweeted that he sent a short message to each of the phones and is now waiting to receive delivery notifications. Earlier, the director of Angkasa Aviation magazine said he was calling his two employees onboard the missing plane and nobody was answering, though a “call waiting tone" could be heard. The plane went missing 20 minutes into its demonstration flight. The aircraft did not return to the airport at the scheduled time following takeoff. By that time, the fuel should have been totally spent. Shortly before going off the radar, the crew of the aircraft had asked for permission to descend. It got permission to descend from an altitude of 10,000 feet to 6,000, after which radio contact was lost. 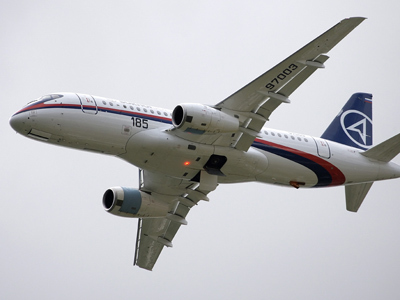 ­The Sukhoi SuperJet-100 is a modern regional jet with a passenger capacity of up to 100 people. 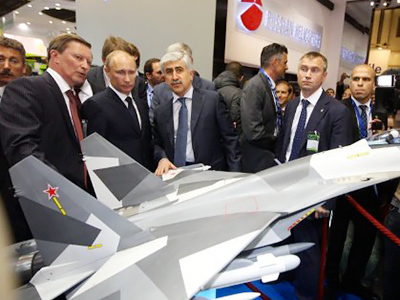 It was designed by the Russian aerospace company Sukhoi in co-operation with Alenia Aeronautica. It is the first civil aircraft developed in post-soviet Russia. The aircraft conducted its maiden flight on May 19, 2008. In January 2011 the plane was certified by the Interstate Aviation Committee. It was subsequently certified by the European Aviation Safety Agency in February 2012. 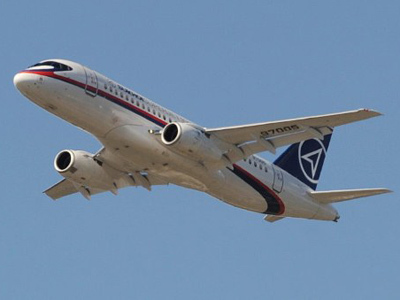 The Sukhoi Superjet 100 flies at a Maximum Operating Speed of Mach 0.81and can reach an altitude of 40,000 feet. The operating range for the basic version is 3,048 km and 4,578 km for the long range version. Since its first commercial flight on April 2011, SuperJet has performed over 3300 flights. Currently there are eight jets operated by Armavia and Aeroflot. There were 50 people onboard, including 8 Russians, two Italians, a French, an American, and 38 Indonesians – mostly representatives from major airline companies. The aircraft was operated by a Russian crew: senior test-pilot Aleksandr Yablontsev and co-pilot Aleksandr Kochetkov. RIA Novosti also released the names of six other Russian nationals. Aero navigator Oleg Shvetsov, flight engineer Aleksey Kirkin, leading test flight engineer Dennis Rakhmanov, test flight deputy head Nikolay Martyshenko, “Sukhoi” company Sales Director Evgeny Grebenshchikov, and contract manager Kristina Kurzhukova were all reportedly on board. Indonesian authorities have called in a crisis group comprising local authorities and Russian embassy employees. Russian Prime Minister Dmitry Medvedev has ordered the Foreign Ministry, the Ministry of Industry and the airplane manufacturer to investigate the incident. The Russian aircraft arrived in Indonesia on May 9 – the fourth stop on its Asian demonstrative tour, which includes six countries in total. The plane had previously visited Myanmar, Pakistan and Kazakhstan. After Jakarta it was supposed to go to two more Asian countries – Laos and Vietnam. The aircraft has already made one half-hour long demonstration flight in Jakarta. The first time it took to the skies, flight attendants from the Sky Aviation airliner, representatives from “VEB-Leasing” company, and others from a Russian insurance agency were on board. During its second flight, the aircraft took the potential buyers – representatives from Indonesia’s Batavia, Pelita, Air Aviastar, and Sriwijaya Air. Olga Kulikova, press-secretary for Russia’s “United Aircraft Corporation”, told RT the first flight went without a hitch and there were no signs of trouble the second time around. Hardware failure, human error or hijacking? ­Shortly before going off the radar, the crew of the aircraft had asked for permission to descend. They received permission to lower from an altitude of 10,000 feet to 6,000, after which radio contact was lost. 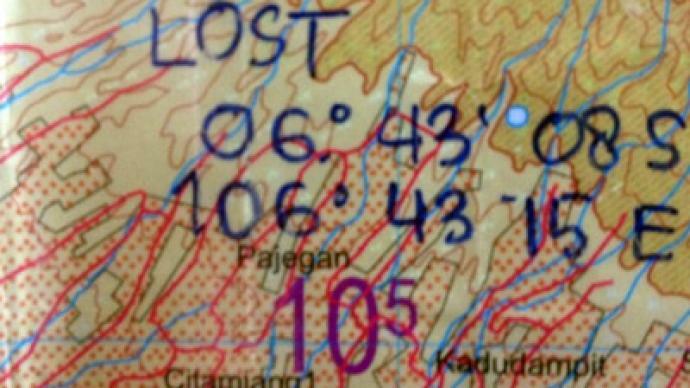 There is a 6,200 foot-high mountain in the area where the plane went missing. Rescuers fear the plane may have crashed into it. The plane's alleged trajectory is shown on a photo tweeted by blogger Sergey Dolya from the emergency operation center. The plane flew around the mountain, then sharply changed course as it began descending near a point marked with black arrows. However, Indonesian aviation authorities have not ruled out the possibility that the aircraft was hijacked. They say that in the case of a crash, an emergency beacon should have immediately gone off, which did not happen. But Chris Yates, an aviation expert, rejects the hijacking scenario because in that case, some kind of “radar blip on the screen” would indicate where the aircraft might be. Meanwhile, David Learmount, formerly of the aviation news website Flightglobal, believes that the fact that this particular flight was a demonstration for prospective customers could be a significant part of the equation. Quite a large number of flight accidents take place purely because the aircraft are being shown off right up to the edges of their potential, he told RT. Meanwhile, witnesses living near Salak Mountain say they heard and saw the missing aircraft flying over the Gunung Halimun Salak National Park, the park’s management told the Jakarta Post. So far the park authorities have failed to locate the plane. ­Since the SuperJet-100 was accepted into service, there have been several minor incidents involving the aircraft. None of the incidents resulted in injury or death. On May 6, 2012, an SSJ-100 shortly veered off of a runway upon landing at the Airport in Kazan. On March 16, 2012, a jet had to make a u-turn and return to Moscow during a flight to Astrakhan after the crew discovered the landing gear had not been fully retracted. 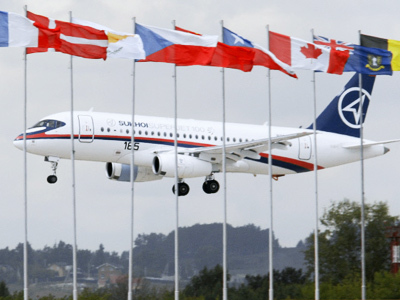 On December 25, 2011, the flight of an SSJ-95 modification of a SuperJet from Minsk was cancelled due to a landing gear failure. 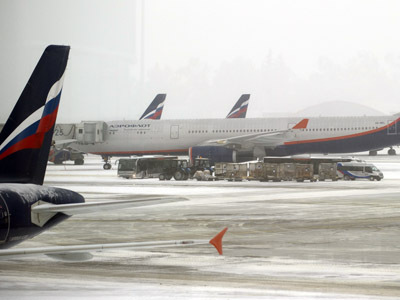 The aircraft returned to Moscow without passengers.